Le Bourget. 23 June 2017. 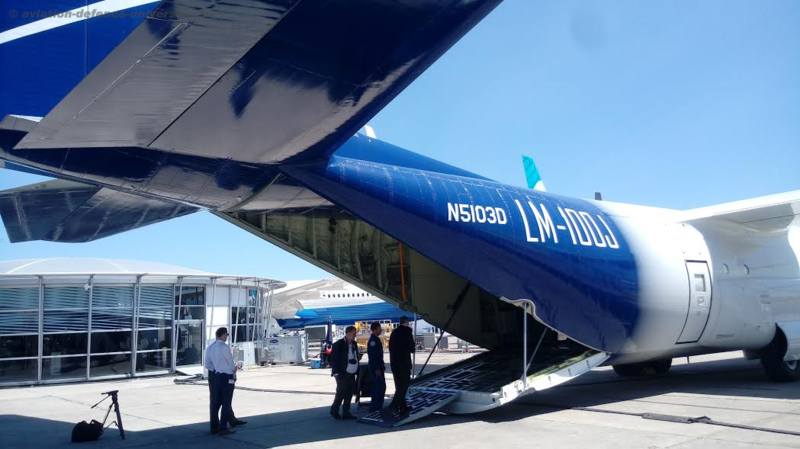 With briefings and presentations concluded in the first half of the day, Lockheed Martin proceeded to take us on a media tour of their latest civil-certified aircraft, the LM-100J, a multi-purpose air freighter which held its very first flight on the 25th May 2017, and is based on the C-130J Super Hercules. Today it is renown to be the world’s most developed tactical airlifter, with the capacity to handle a large number of civil missions and operations across the globe. 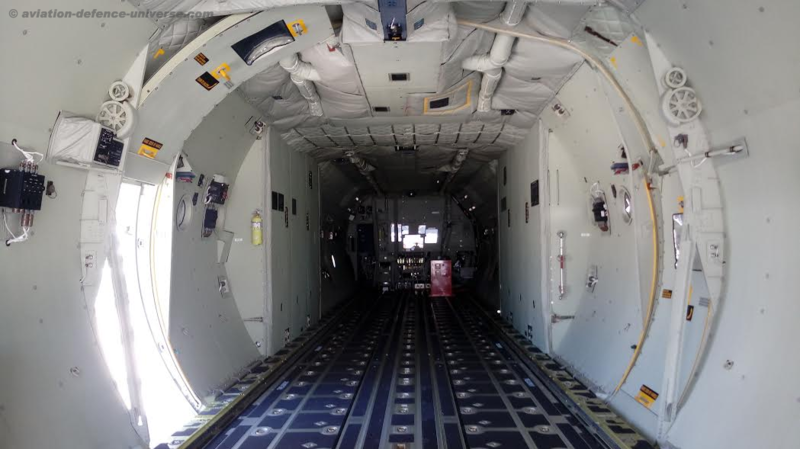 As I approached the LM-100J and made my way up the lowered cargo bay doors, I couldn’t help but notice how spacious the interior really was; a deep cargo bay, whitewashed and shiny, the black padded floor of a texture that gripped with might and held one in place. As press we were warmly welcomed in, two engineers buoyantly directing us into the depths of this aerial structure, providing details about its constitution and construction. The interior had hooks from bottom to top, with a capacity to take-off with a weight of 164,000 lbs. As I looked around, the group moved onwards, straining to hear the engineer over the sound of the four Rolls-Royce AE 2100D3, 4,691 PSHP turboprop engines. I slowly followed to the cockpit door, and listened as the engineers explained along the way the newly implemented system, initially installed in the C-130J Super Hercules, which allows for precise delivery and, more importantly, airdrops. There are “years of science and development” invested with “a lot of systems designed in this airplane to support precise airdrop”. This tactical airlifter contains all the technology of its predecessors, excluding the military capabilities, granting it a payload of 45,800 lbs while maintaining a maximum cruise speed of 355 KTAS, or 60 km/h. The LM-100J thus incorporates a system that facilitates the movement of cargo, seeing as in older systems the lock presets would have to be set manually in order to open every single one. Today, “the computer will do it for you. Once it moves it all out of the way, the load will extract.” Furthermore, even though the bay has to be loaded “shoving palettes in” the plane, other ways of loading it do exist, and, depending on the load, it can, of course, be wenched in. It may all depend on palette build and structure of the cargo; one matter is sure though, that vehicles can also be transported, with the engineer stating that he’s seen up to three Humvees taken in the cargo bay. Furthermore, the hooks can attach and lift all the way up within an inch of the ceiling, providing the room and space needed for larger cargo. 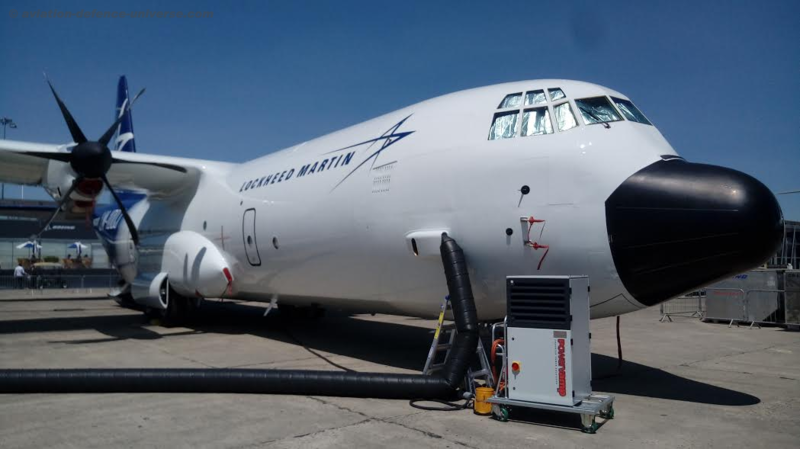 After an interview with an ex-USAF 20-year veteran pilot now working on the LM-100J, I slowly trekked back out into the sun and heat of Paris. Taking a lasting look at its exterior, I began to take the last photographs, realising that the piece itself surely was an interesting construct. It stands at almost 12 m in height, over 34 m in length, and a wingspan of over 40 m that holds 4 composite 6-blade propellers; a modern multi-purpose freighter that could cover anything from oil and gas exploration and mining logistics to medevac, firefighting, and humanitarian relief.